Procrastination – Good or bad? Is procrastination good or bad? Is procrastination good or bad? The outcome will tell you the answer! 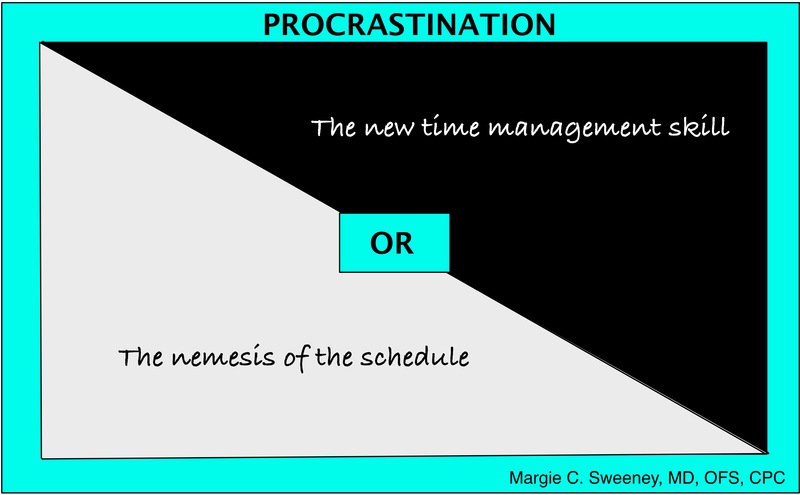 In this post, I will give some reasons why procrastination is not necessarily a bad thing! I’m not, however, advocating that the ends justifies the means. Even if the outcome is positive, if the reason for procrastinating is lacking, then procrastination can become a bad habit to acquire! First, let’s explore possible reasons for procrastination. The activity or task is not pleasant or rewarding. The activity or task causes stress or other negative reactions or emotions. The activity or task is potentially harmful to self or others. There is not enough information to make a decision or to move forward. There is no time in the schedule for implementation. Others are dissuading the decision or otherwise being nay-sayers. The activity or task is illegal. You don’t believe you have the appropriate tools, talents, or financial means to accomplish the task. Lacking the knowledge of where to begin or how to implement the task. Feeling coerced or manipulated to perform the activity. Being rushed into making a decision or beginning a project or task. Just plain don’t want to do it! I’m sure there are other reasons you can think of for procrastination. All of the above reasons can be legitimate reasons for procrastination but they can also be excuses or can be masking a hidden issue. Knowing yourself will help you discern which is the case. So, what are legitimate reasons to procrastinate? The activity or task is not pleasant or rewarding. In and of itself, this does not seem to be a good reason. There are many things we must do each day that are not pleasant or do not offer rewards but are a necessary part of life. If this is a task that you can delegate to someone who can do it without an adverse feeling toward the activity, then this would seem like a reasonable option. The activity or task causes stress or other negative reactions or emotions. This alone is not a good reason to procrastinate. Stepping out of your comfort zone can lead to growth. If the reasons for negative reactions or emotions have a different underlying reason(s), this needs to be explored and dealt with. The activity or task is potentially harmful to self or others. This is a no brainer. In this case, procrastinating is not going to remove any potential for harm. The activity or task must not be engaged in until it can be modified to remove the potential for injury or harm. There is not enough information to make a decision or to move forward. It is prudent to have sufficient information to make a sound decision. In this case, procrastination is indicated. There is no time in the schedule for implementation. This is a legitimate concern, provided that it is not a hidden excuse. Explore options that will open up the schedule for the task being considered. Others are dissuading the decision or otherwise being nay-sayers. You need discernment on this one. Sometimes those other voices are correct. For more information on discernment, see my post on this topic. The activity or task is illegal. Procrastination has no place here. Obviously, just don’t do it! You don’t believe you have the appropriate tools, talents, or financial means to accomplish the task. Is this an excuse or a fact? Get the resources you need to get the job done. Fear of success. This is a real possibility. Discernment is needed here. Fear of failure. Know yourself. Get the necessary help. Lacking the knowledge of where to begin or how to implement the task. You don’t want to blindly jump into a project or situation. Get the necessary help. Feeling coerced or manipulated to perform the activity. Discernment is needed here although it is usually a gut feeling when you are being coerced or manipulated. Be strong, call the behavior out and hold the other accountable for their actions. Being rushed into making a decision or beginning a project or task. Find out the reason for the time crunch. You might be able to negotiate a deadline or get assistance to meet the goals. Just plain don’t want to do it! This is a personal choice. We have free will. Just be aware that all decisions have consequences. Can you live with the consequences? As you can see, procrastination has its place. Be a discerning individual and make wise decisions. You will increase your chances of success! As always, I’m available for questions, coaching, etc.